Crystals vibrate at a very high frequency and hold incredible amounts of knowledge. Sometimes our body frequencies decrease due to stress and dis-ease. Using the crystals we can re-tune the body to come back into balance serving to put us in the best state for our bodies to care for us. Each crystal holds metaphysical healing properties based on both colour and mineral content. Some serve to remove negative energies. Some serve in protection against things like psychic attack. Some help us ground when we feel scattered or overwhelmed. Some help us to communicate with our higher selves and Spirit. Crystals amplify and/or quicken the work we are doing to support bringing one's energy bodies back into balance. Usually in a first session I would do a basic chakra layout to get your system flowing. 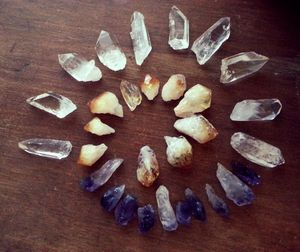 I would dowse for the right crystals for you and lay them accordingly along your chakra centres at the beginning of the session and then proceed with a full head to toe Reiki treatment.